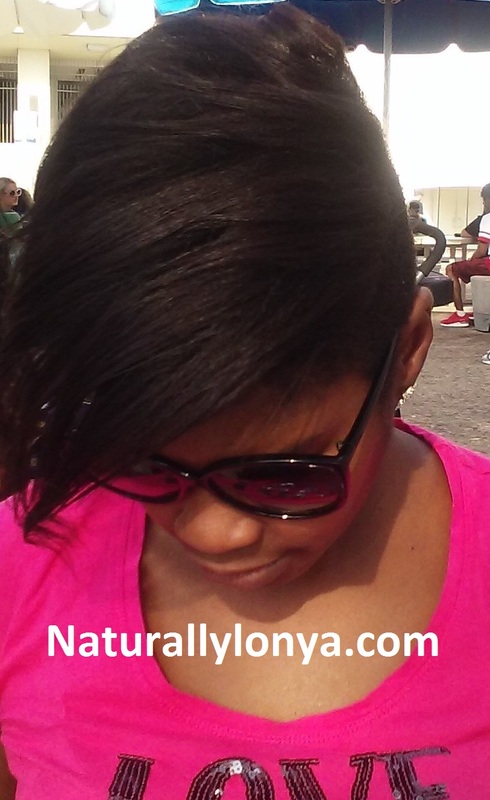 Relaxed hair is chemically treated (straighten) Black or African American hair. Although the process of achieving straight black hair can be harsh on black hair, it is still possible to obtain healthy hair. One of the keys to having healthy straight black hair is to make sure you are properly maintaining the hair as much as possible. Any type of chemical or continued use of excessive heat can cause breakage, stunt hair growth, and could possible result in the lost of hair in extreme cases. So what can you do to maintain healthy relaxed hair? Stretching is a method that many relaxed haired african american women utilize in order to keep their hair thicker and healthier. When you allow more time to past from the time you put on one *perm to another, you give your hair a chance to grow a little longer. This means that you will have a better chance of only applying the chemicals to just the new growth. It also gives you more time to strengthen the already straighten hair with proper black hair care maintenance. When you apply a treatment over already chemically treated hair, you are asking for hair breakage. This weakens the hair and makes it fall out. You might also cause alopecia, because you can “burn out” the hair follicle and cause it to never regrow hair on that portion of your scalp. Make sure to apply the relaxer on the new growth portion of your hair only. Chemically treated hair needs more protein that any other hair type because the chemicals strip the protein out of the hair during the straighten process. Hair then can become very weak if protein is not put back into the hair. This is very importance especially the day the *perm is set on the hair. Most stylist know to follow the relaxer treatment with a protein and moisturizing deep conditioning. Now if you want to do a hair protein treatment that is best a few weeks after the treatment has been set on the hair. Hard protein treatments much be followed by a moisture balancing conditioner rinse so hair will not become too stiff or lifeless. The hair routine should include switches from protein deep conditioning two times a month and a conditioning deep contioning two times a month in order to maintain a healthy hair balance. This can be very tough for women who love straight styles, but if you want healthy hair, you need to lay off the heat. Think about it, your hair is already in a weaken state because of the chemicals. Then you add more injury to it by straightening it every day with a flat iron. Or you always blow dry and flat iron your hair after every wash. This can be very harsh on the hair strand, thus causing breakage. Use heatless styles such as rollersets to create healthy hairstyles. Air dry your hair using the scarf method instead of using blow dryers. If you just can’t let go of the heat use indirect heat like a hair dryer that you sit under or steam rollersets. These are some basic that will help you start on your way to healthier relaxed hair. *The term perm is also used in the description of chemically treating african american hair.